Not that anyone called it the Spanish Flu then. When influenza first struck soldiers training for World War 1 —in early March of 1918 at Camp Funston in Kansas—army medical staff didn’t concern themselves. 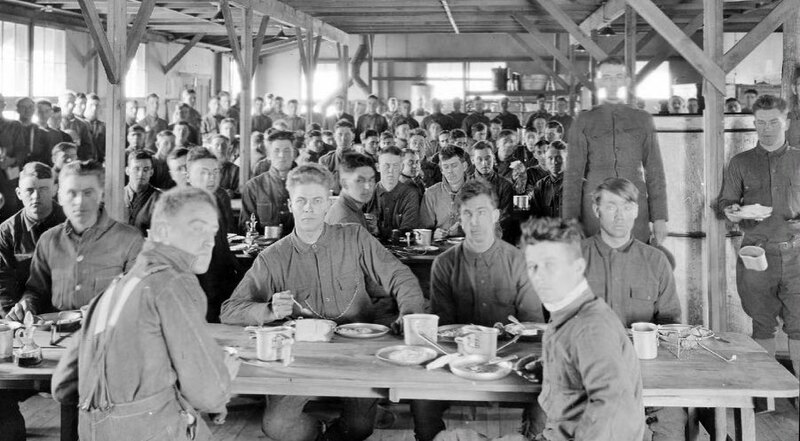 Contagious diseases such as influenza attacked often with so many people crowded in mess halls and barracks. Better to let them share it and get it over with before they deployed to France. Camp Funston resembled a city more than an army camp and housed some 50,000 soldiers training for World War 1. Some 50,000 doughboys trained at Camp Funston, more a city than army camp. Spread across a large meadow near Ft. Riley, hastily constructed rough wood planks formed barracks, general stores, recreation huts, and even a coffee roasting house. 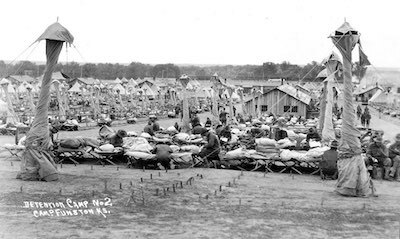 The army built some thirty camps across the country to train their million volunteers and draftees for World War 1. Within two weeks of a cook reporting to the camp hospital with influenza, 1,100 soldiers were admitted, and thousands more lay feverish in their barracks. Though doctors noted the unusual symptoms—fevers ran high, noses and ears bled, and young, robust men started to turn blue and die—no one questioned deploying troops. A war needed to be won. Troop trains transferred soldiers from camp to camp by the thousands, and then into east coast ports and onto ships bound for Europe. Influenza rode along. By the end of April, two-thirds of the army’s training camps reported influenza outbreaks. And then it erupted in Brest, France, one of the main debarkation ports for American soldiers. It moved quickly through the crowded military cantonments along the Western Front and on to the Middle East and Asia, infecting World War 1 Allies and Central Powers alike. In the span of 15 months, over the course of its three waves, the 1918 influenza pandemic killed over 50 million people. Some 650,000 died in the United States. One out of three people were sick. Where Did the Spanish Flu Start? Although some historians and scientists argue the 1918 influenza pandemic began elsewhere—in France in 1916 or China and Vietnam in 1917—many believe the flu spread from Haskell County, Kansas to Camp Funston. Haskell County’s Dr. Loring Miner is on record with the first reported case, and the local newspaper, the Santa Fe Monitor, reported soldiers and families traveling back and forth between Haskell County and Camp Funston in February. Wherever it began, the deadliest outbreak in history did not originate in Spain. Neutral Spain—who wasn’t censoring its press on behalf of war efforts—was the first to report on the noticeably virulent disease. In early summer, they reported their King was sick and many were dying of extraordinary influenza. Soon newspapers around the world began reporting on the “Spanish Flu” which perhaps should have been named the Kansan Flu.